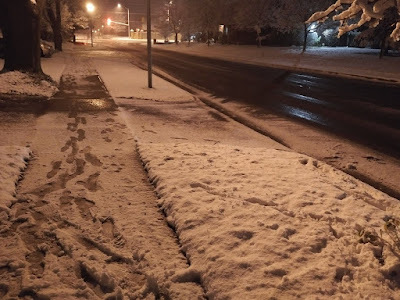 The annual rite of almost-winter in pretty much every Canadian town - the first snow of the season - rolled through our burg tonight. Sure, we had an early morning dusting a few weeks ago, but this time there was actual accumulation. I didn't want to miss the moment, so when our daughter and I were walking the pup tonight, some pixel-gathering was on the menu for both of us. While we alternated leash-holding with shooting, Frasier the Wonderdog happily bounced through the clumpy snow. We both swore he was smiling as he did. The snow will inevitably get deeper, the temperatures colder and the winds more biting over the next few weeks and months. But as long as I get to experience it surrounded by those who matter, it'll always feel warmer than the weather app on my smartphone suggests. Your turn: How do you stay warm when winter moves in? Wow, snow in London before Ottawa! Now that't a first! Hasn't gone down below 0 celsius in the last three days though it doesn't get much higher than 5 celsius during the day. Happy Sunday. How I stay warm: Hot tea, lap blankets, knit caps, soup, and doing lots of baking! We just had flurries here today (Western Pennsylvania). I have to start remembering to pull the car into the garage. We had the tiniest bit of snow that lasted all of five minutes! Very nice! Except for about 10 days, it's felt like summer here for about the last 9 months.